“When the U.S. has to fund its deficit through the combination of issuing more Treasuries and printing more dollars, it is inevitable that the dollar will continue to weaken,” Deputy Governor Zhu said at a forum in Beijing today. BEIJING (Reuters) – It is getting harder for governments to buy U.S. Treasuries because the United States’ shrinking current-account gap is reducing supply of dollars overseas, a Chinese central bank official said on Thursday. The comments by Zhu Min, deputy governor of the People’s Bank of China, referred to the overall situation globally, not specifically to China, the biggest foreign holder of U.S. government bonds. Chinese officials generally are very careful about commenting on the dollar and Treasuries, given that so much of its $2.3 trillion reserves are tied to their value, and markets always watch any such comments closely for signs of any shift in how it manages its assets. 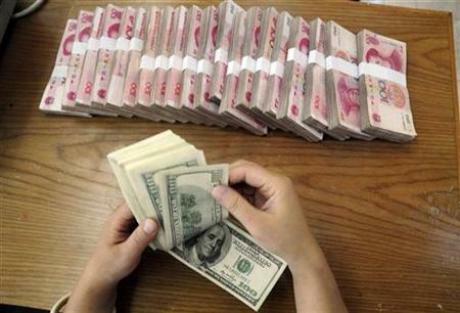 China’s State Administration of Foreign Exchange (SAFE) reaffirmed this month that the dollar stands secure as the anchor of the currency reserves it manages, even as Beijing seeks to diversify its investments. In a discussion on the global role of the dollar, Zhu told an academic audience that it was inevitable that the dollar would continue to fall in value because Washington continued to issue more Treasuries to finance its deficit spending. He then addressed where demand for that debt would come from. “The U.S. current account deficit is falling as residents’ savings increase, so its trade turnover is falling, which means the U.S. is supplying fewer dollars to the rest of the world,” he added. China continues to see its foreign exchange reserves grow, albeit at a slower pace than in past years, as it still enjoys a large trade surplus and significant inflows of foreign investment. They stood at $2.27 trillion at the end of September.